Well it is a great time of year isn’t it? The back end of August is nice and hot, summer is in the air, and the chinook are rolling in! We had some good to great fishing this past week for chinook off the Bell Buoy, T-10, and Sandheads. The exact location depended on the wind. The hot weather brings in the NW winds and some days it was just too rough to get past the Bell Buoy. On the days when we could head south we had some fantastic fishing at T-10 and Sandheads. It seems the orcas also knew about the chinook showing up as we saw them multiple times this past week. It basically broke down like this. If the winds were favourable and the orcas weren’t around, the fishing was awesome. When the winds were blowing and the orcas were in, the fishing was a lot tougher. It really varied from day to day and even from morning to afternoon, but that is fishing. This week we are going to take a detailed look at how to catch these chinook that are hanging around getting ready to go up the Fraser. The next 2 weeks will be some of the best of the year so use these techniques to get out there and catch some fish. The first thing we are going to talk about is how deep to fish. These fish are not deep. They are up shallow getting ready to go up the Fraser and getting used to the lower salinity waters. We catch these fish on the downriggers from 30 –90 but the most action is usually 40-65. If you are fishing 2 rods, 1 per rigger, try fishing 45 and 65 and you will do well. If you are fishing 2 rods per rigger, use a 25 foot spread and have one rigger between 70 to 80 and have the other rigger between 50-60. This will give you a good spread from 30 to around 80 and you have lots of gear in the most productive zone. Keep an eye on your sounder, as sometimes you will see the fish and you can further dial in your depth. For flashers I am going to show you some of the best. The water isn’t too dirty this year so on your shallowest rod you should be running a metallic flasher. On my top rod, which is about 30 or so, I have been running a metallic silver Betsy with a matching metallic teaser head. This has been very productive. On my second deepest rod, in the 50 foot zone, I have been running a Green Onion Glow. On my third deepest rod, in the 60 foot zone, I have been running a Salty Dawg and on my deepest rod, in the 70 foot zone, I have been running a Green Footloose. 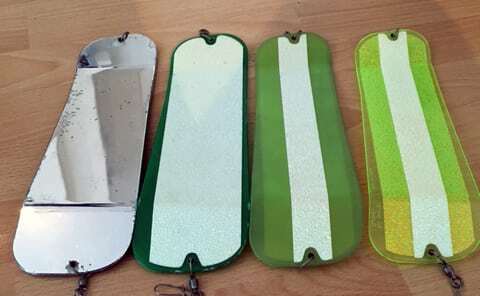 The Salty Dawg and Green Footloose both have a lot of glow and this is important when you are fishing down in the 60-80 foot zone off the Fraser as it is pretty dark down there. The Green Onion Glow is perfect for the 50 foot zone as it has some reflective qualities but also has a strip of glow tape down the middle. Below you will see pictures of all these flashers and I took pictures of both sides so you can see the reflective tape as well as the glow tape. From left to right, Betsy, Green Footloose, Salty Dawg, Green Onion Glow. Now let’s talk about what lures to use. If you want you can use a white glow hootchy with a 32 to 40 inch leader or a some sort of spoon that has some glow and green in it like a Pesca Gut Bomb or Leprechaun or a Kingfisher Irish Cream or Flamin Hans, and use a 6 foot leader with the spoons. Both hootchies and spoons will work, but you should put some herring or anchovy gel scent on there as well as chinook are highly sensitive to smell. If you really want to catch fish though, use bait on all 4 rods. These fish are all about the bait and it makes a big difference on some days if you are using bait versus a spoon or a hootchy. When I am fishing 4 rods I run bait on all 4. I often run 2 anchovies and 2 herring. It seems most are familiar with how to run anchovy so I am going to talk about herring today. My favourite way to run herring is to buy the green size. When you buy herring it will often be colour coded on the package. Red is small, green is small/medium, blue is medium, purple is large. The green and blue are the 2 most popular sizes. My favourite size is the green and you will get a killer roll on these if you put them in the Rhys Davis Bullet Roll teaser head. This teaser head was originally designed for larger anchovies but it works wonders with a green herring. If you fish these teaser heads with green herring you will get a fantastic roll and the springs really seem to slam it. Use a 6 foot leader of 30 pound test Maxima Ultragreen or 30 pound test Seaguar STS Fluorocarbon. For hook sizes I like a #2 treble for mid body on the bait and #4/0 trailer hook. For teaser head colours you want ones with lots of glow, green, and chartreuse. 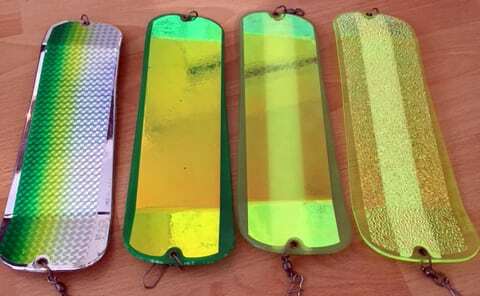 You will also want a metallic green and chartreuse one for your shallow rod when you are using the Betsy flasher. Below is a picture of these Rhys Davis Bullet Roll teaser heads all rigged and up ready to go for my charters this weekend. You will notice in the picture I have take a glow eye and put it on the teaser head. This is another good tip. Predatory fish that feed on bait fish all key in on the eye. 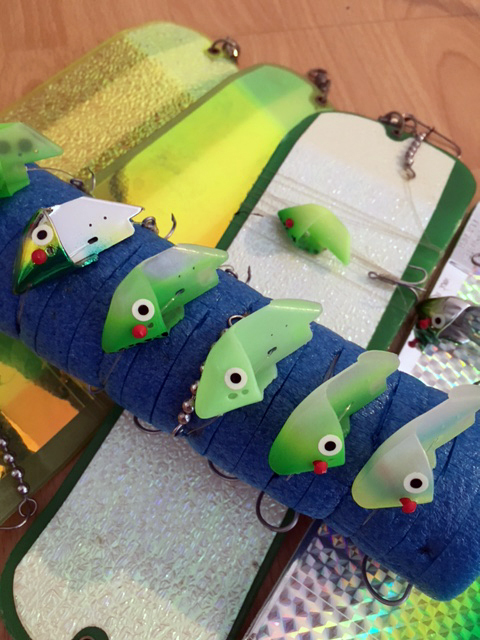 That is why a lot of lures and flies make prominent use of the eye, as it is a well know fact among saltwater anglers around the world that predatory fish key in on the eye of their prey. So buy some of the glow stick on eyes in our teaser head section and stick them on your favourite teaser heads and your favourite spoons as well. Some of my top producing Bullet Roll teaser heads ready for green sized herring. If you fish the flashers mentioned in this report with a 6 foot leader and some anchovies and herring, at the depths mentioned, you will definitely be getting into some fish the next 2 weeks. Most of the fish right now are going to be red springs and as we get into the first week of September we will start to see some of the white springs. The reds have been in the 10 to 20 pound range and the whites are usually a bit bigger from 15 to 25 pounds with a few tipping the scales in the 30 pound class. Ben braved the wind and whales on Tuesday and was rewarded with this 16 pound red spring from Sandheads. These red springs are excellent eating and will make you a popular guest at your end of summer BBQ! The bounty of a 10 hour charter down at Sandheads. 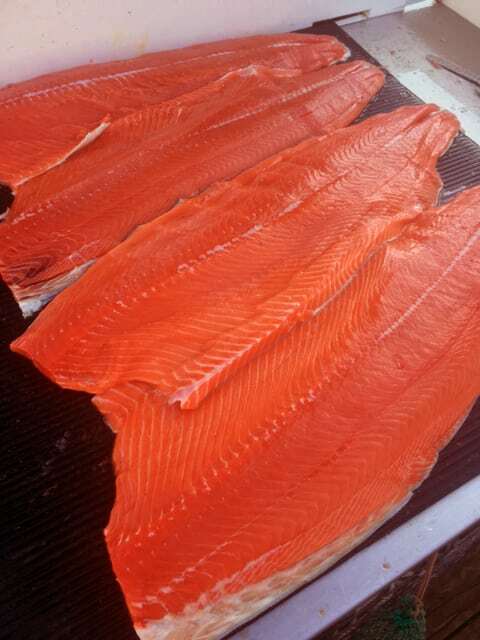 Beautiful red chinook fillets. 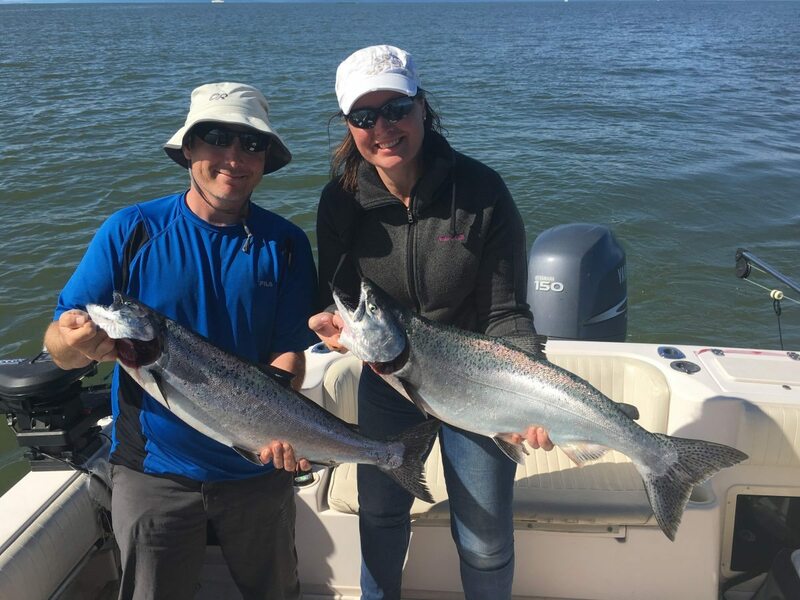 If you are planning on getting into some chinook this summer, this is the time, book now, or come in the shop to pick up all the gear featured in this report. 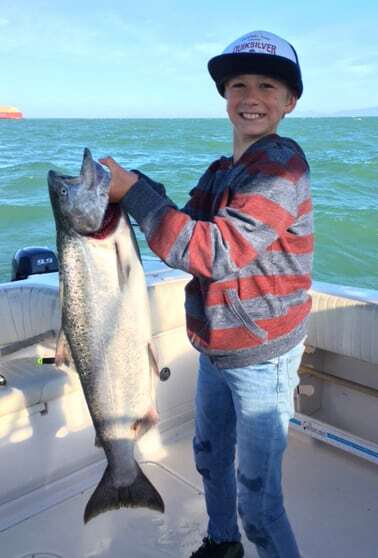 Education is key to keeping wild Pacific salmon healthy and abundant. You can support the next generation of salmon stewards by supporting avid anglers Bill Watterson and Bob Kronbauer and their latest project. Bill and Bob are passionate supporters of the Pacific Salmon Foundation – that’s why artist Bill and Bob created the unique ‘Salmon Spawners’ design. 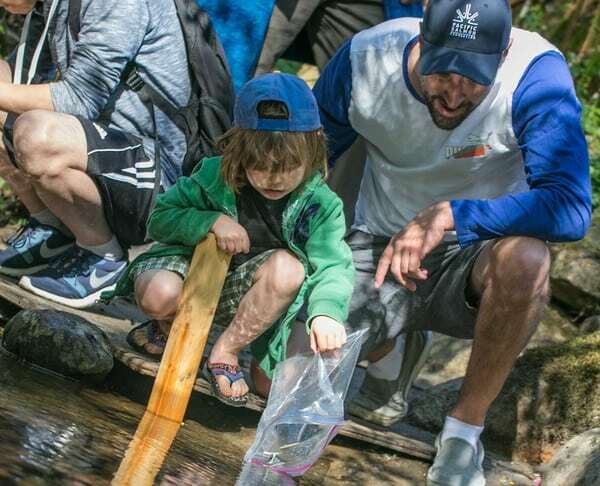 When you purchase a product, t-shirt, button, poster or print from this page, all proceeds will support grants to classroom education about Pacific salmon conservation. Every year the Foundation equips classrooms to teach students about the lifecycle and conservation of Pacific salmon. Students learn about the salmon lifecycle while raising young salmon from egg to fry in classroom aquariums. At the end of term, students release the fry into the wild. Your support will inspire young people to conserve our watersheds and wild Pacific salmon for generations to come. Learn all about it and buy the artwork/t-shirts/etc. here!